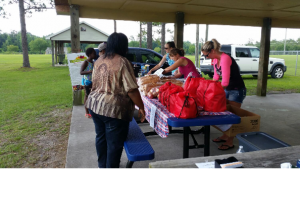 Cstore will be supporting the Saturday in the Park Summer Food Program in Holly Ridge. When classes dismiss for the summer, numerous children in the community lose the benefit of schools meals. This program will be held at the Municipal Park in Holly Ridge every Saturday this summer (11 Saturdays). Our initial goal is to serve 50 children each week. We will provide a meal on site from 11a-1p and any child that participates will receive a backpack of supplemental non perishables for the week. We are estimating that each backpack will cost approximately $15 (11 weeks x 50 children x $15 = $8250). Please consider donating. Even a small donation can make a big impact! 100% of all donations will be used to purchase food items to donate to children participating in this program.